This recipe really isn't new. The basic recipe was for years a Passover favorite in my house, made from memory so often that I don't remember exactly where it came from anymore. For today's challenge, however, I jazzed it up slightly with some cayenne pepper. But if you are the kind who thinks mayo should tone down its spices, feel free to reduce or omit either/or pepper entirely. Play with the chips to your heart's content. I used plain ol' 'tater chips (low-salt ... the Try-n-Save had a sale), but I bet sour cream and onion chips would be three kinds of heaven. Preheat oven to 400F. Lightly grease a rimmed baking sheet. Set aside. 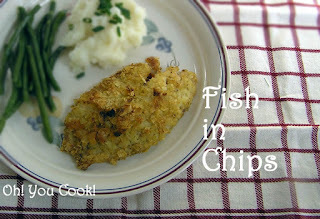 Welcome to this month's kosher linkup! The challenge this month is cold soup. In the distant past I've made vichyssoise (French for "fancy-schmancy cold potato soup"), but past recipes don't count today. I've never got around to posting my version of gazpacho, but figured it would be a popular choice, so I went with something a little different: cucumber-yogurt soup. 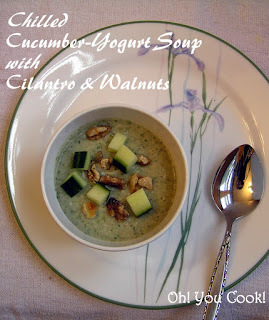 Many recipes on the intertubes flavor this refreshing soup with dill. I tried it once and to me, dill makes it taste like watered-down tzatziki sauce. So I went with the more unusual suggestion of cilantro.